LUS attended the Social Security Summit convened by Unite Community and PCS in Birmingham on 31st October. 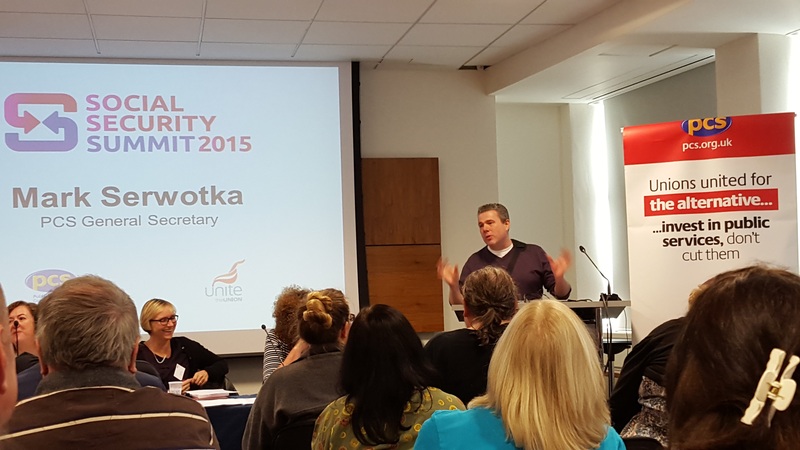 Keynote speakers included Unite Assistant General Secretary Steve Turner and PCS General Secretary Mark Serwotka. Their presence was an indication of the importance both unions are placing on the need to build stronger links with unemployed people in the fight against the £12 billion cuts to the welfare budget. The meeting was well attended by hundreds of delegates from all over the country. The proposed cuts to working tax credits was seen as a major potential campaign that could link unemployed and employed workers. Mark Serwotka stressed the need for all trades unions to make the issue of benefits cuts to the unemployed a high-priority issue on the TUC agenda. Colin Hampton from TUC Unemployed Workers Centres stressed that a major way of doing this was to promote the Welfare Charter and get it endorsed at every level of the trades union movement. He said that the new developments within the Labour Party made it more inclined to support such initiatives. He therefore urged trades unions to take advantage of this to add momentum to the campaign. Paula Peters from DPAC said that her organisation was launching a ‘No More Claimant Deaths’ campaign alongside Black triangle in Scotland, following the large numbers of suicides and other deaths linked to Work capability Assessments. They are lobbying Jeremy Corbyn to devote a whole PM’s question session to this issue.